Elizabeth Jordan, daughter of William Jordan and Blanche Fullerton, was born circa 1800 probably in Kanawha County, (West) Virginia. Elizabeth moved with the other members of her family to Tippecanoe County, Indiana, in 1827. She married Andrew Courtney in Tippecanoe County, Indiana, on September 2, 1830, and together they had five children. Elizabeth died young, sometime between 1841 and 1844, probably in Tippecanoe County. Her burial place is not known. Andrew Courtney remarried on March 6, 1844 His second wife, Elizabeth Blain Knight, was the widow of Thomas Knight and the daughter of John Blain. Elizabeth brought two small daughters to the marriage. Andrew died later that year, and the next year Elizabeth gave birth to his daughter, Pauline Courtney. Subsequently, Elizabeth married John I. Burns. Elizabeth Jordan Courtney is possibly in the 1820-CabellVA census in the household of William Jordan and probably in the census of 1840-TippecanoeIN in the household of Andrew Courtney. 1. Mahala “Hale” Courtney was born in 1831 in Tippecanoe County, Indiana, and died on September 10, 1896 in Chicago, Cook County, Illinois. After her parents’ deaths, Mahala lived for a time with her Aunt Mary Murphy. She married John Trend Norrish, the son of John Norrish and Mary Everleigh, on May 18, 1853, in Tippecanoe County, Indiana. John was born in England in June 1827, arrived in New York City aboard the “El Dorado” from London on May 16, 1850, and died on December 18, 1906, in Chicago, Cook County, Illinois. Both Mahala and John are buried in Oak Woods Cemetery, Cook County, Illinois. 2. Orin Courtney was born circa 1833 in Tippecanoe County, Indiana. After his parents’ deaths, Orin lived temporarily with his Uncle James Jordan. He married Elizabeth Griffin on August 26, 1858 in Benton County, Indiana. Elizabeth was the daughter of Phillip Griffin and Elvira Milburn, born on January 28, 1838/39 and died on April 2, 1920. Orin died on April 1, 1877. Both Orin and Elizabeth are buried in Griffin Cemetery, Templeton, Benton County, Indiana (she is buried next to her third husband under the name of Elizabeth Fox). 3. 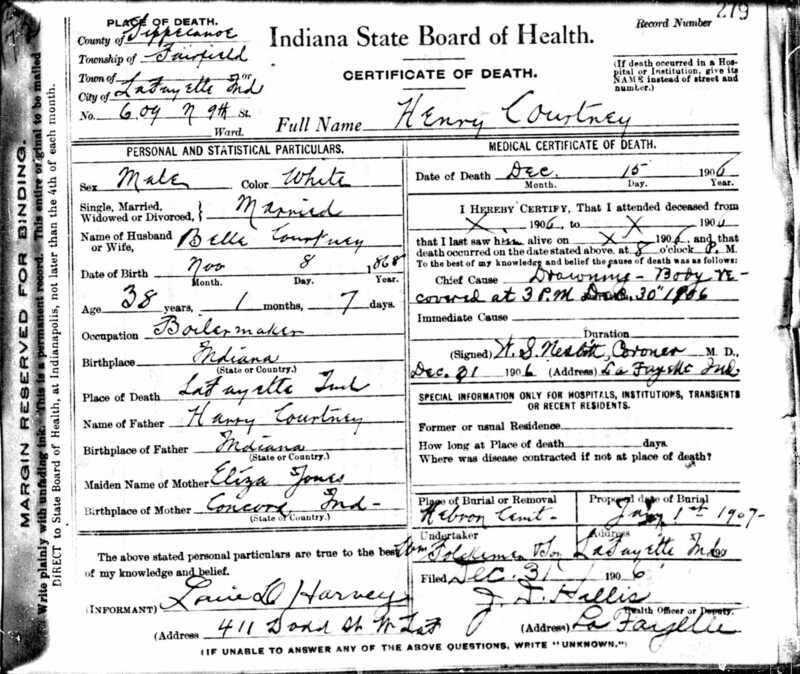 Harrison Courtney was born in November 1834 in Tippecanoe County, Indiana, and died October 18, 1912 in Lafayette, Tippecanoe County, Indiana. He is buried in Hebron Cemetery, Tippecanoe County, Indiana. After his parents’ deaths, Harrison lived temporarily with his Uncle James Jordan. Harrison married Louisa “Eliza” Jones on August 3, 1868 in Tippecanoe County, Indiana. 4. Henry Courtney was born circa 1838 in Tippecanoe County, Indiana, and died after 1880. After his parents’ deaths, Henry lived temporarily with his Uncle John Jordan. He married Susan A. May, daughter of George M. and Mary May. Susan was born in Virginia in 1833, and died in Indiana in 1876. She is buried in Welsh (Egypt) Cemetery, Jasper County, Indiana. 5. Minerva Courtney was born circa 1841 in Tippecanoe County, Indiana, and died in 1847. 6. Pauline Courtney was born on January 13, 1845 in Tippecanoe County, Indiana. She married Joseph Cook on August 24, 1861 in Tippecanoe County. Joseph was born in Indiana around 1842 and died circa 1878. Pauline died in Chicago, Cook County, Illinois, on March 5, 1915. Both she and Joseph are buried in Brookston IOOF Cemetery, White County, Indiana. 1 Proof that Elizabeth Jordan Courtney is the daughter of William and Blanche is found in several court documents, including Tippecanoe County Final Record Vol 6 (pp119-121) November 1847, where her children are said to be heirs of their grandfather, William Jordan. 2 The only documentation of Elizabeth’s birth date is in two census records–in 1820 she was probably 16-26; in 1840 she was 30-40–placing her birth sometime between 1800 and 1804. Elizabeth’s husband, Andrew Courtney, remarried on March 6, 1844 and died later that year, according to Tippecanoe County Court Records, after which their five children became wards of Elizabeth’s brother, James Jordan. 1850 census records show that four of their children were divided up and living with her sister Mary and brothers James and John. The youngest, daughter Minerva, had died by this time. Elizabeth and Andrew’s marriage in 1830 is recorded in Tippecanoe County, Indiana, marriage records. 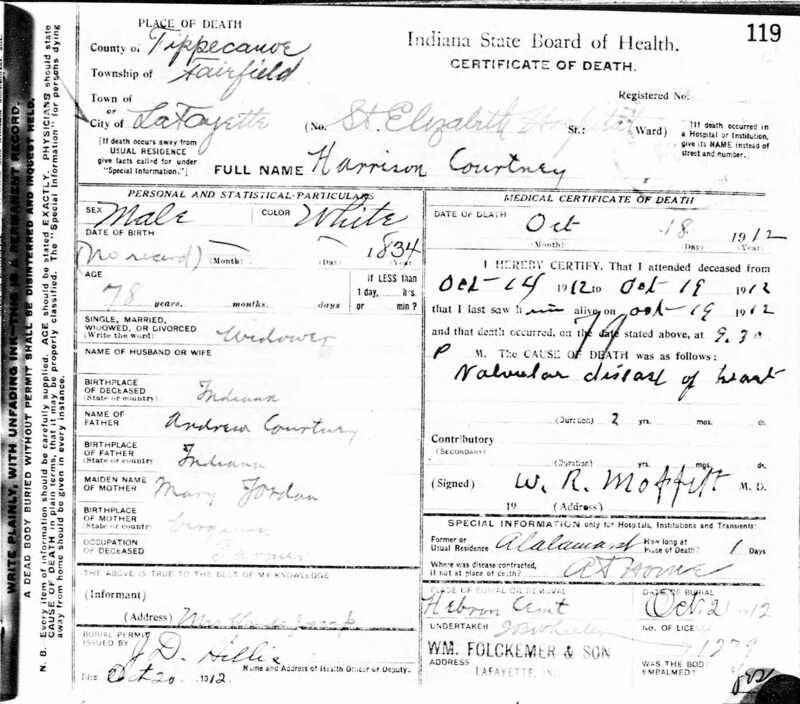 Information on Elizabeth’s children comes from census records; Tippecanoe County court records; Indiana Death Certificates; and Aunt Mollie’s Diary.